The weather’s warming up, Christmas is around the corner and backyard summer barbecues are about to become a regular fixture of our weekends. For the kids, a trampoline can take these backyard stints to the next level. There’ll be sibling jumping competitions, ball games and star gazing all summer long. The Springfree Trampoline® is Australia’s safest trampoline, engineered for child safety with no hard edges and a hidden frame – and it’s backed by a full 10-year warranty. 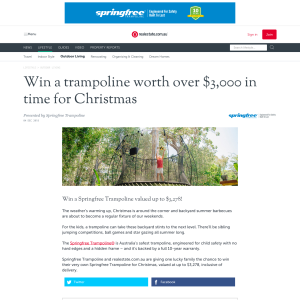 Springfree Trampoline and realestate.com.au are giving one lucky family the chance to win their very own Springfree Trampoline for Christmas, valued at up to $3,278, inclusive of delivery. You are entitled to enter once only. Entries will be judged on originality and creativity. We will judge the entries at 511 Church Street, Richmond, Victoria, at 12:00 on 17/12/18. Entries will be judged by a Promoter representative. 1. By entering this promotion, you accept these Terms and Conditions (Terms). 2. To enter, you must be an Australian resident aged 18 years or over. 3. We do not accept entries from our employees (and their immediate families) or employees of any company associated with this promotion. Immediate family includes current or former spouse, child, parent or grandparent, uncle, aunt, niece, nephew, brother, sister, or cousin. 4. We may contact you to verify your identity, age or place of residence to confirm your eligibility to enter. 5. We may disqualify you if we reasonably believe that you have breached these Terms or have compromised the fair conduct of this promotion by acting unlawfully or improperly. 6. You are fully responsible for all of your entry content and materials, including all comments, responses, videos, artwork and images (Entry Content). 7. If only one entry is permitted per entrant, your first entry will be deemed to be the entry (we will disregard later entries including ones submitted via alternative email addresses/accounts). 8. We may remove or refuse to publish Entry Content without notice. 9. If your Entry Content breaches clause 10or is incomplete, indecipherable or inaudible, we will deem the entry invalid. (d) if your Entry Content depicts, quotes or refers to another individual or the brand or product of another entity, you have the consent of that individual or entity. 11. You consent to any use of the Entry Content which may otherwise infringe the Entry Content creator’s/creators’ moral rights under the Copyright Act 1968(Cth) and you warrant that you have full authority to give that consent. 12. You agree to indemnify us for any of your breaches of clause 10 or 11. 13. You grant us and our related entities a non-exclusive, royalty-free, perpetual, worldwide, irrevocable, and sub-licensable right to use, reproduce, modify, adapt, publish and display your Entry Content for any purpose, including but not limited to future promotional, marketing or publicity purposes,in any media. 14. You agree that if you are a winner, you consent to us using your name or image to promote this promotion and any products or services we supply. 15. Each entry will be individually judged based on the Judging Criteria.This is a game of skill and chance plays no part in determining the winner. 16. We may select additional reserve entries which we determine to be the next best, and record them in order, in case of an invalid entry or ineligible entrant. 17. Our decisions are final and no correspondence will be entered into. 18. If you win the prize but do not take it (or part of it) at the time specified by us, then you will forfeit the prize (or the relevant part of it). 19. If the prize (or part of it) is unavailable, we will provide a substitute prize of equal value and/or specification. 20. You cannot exchange the prize (or any part of it) for cash, goods or services. 21. The value of the prize at the time we provide it may be different from the value advertised in our promotional materials. We are not required to ‘make up’ any difference in value. 22. The prize may require you to accept terms that apply to the use or supply of the prize (for example terms and conditions attaching to subscription products, supply of goods, event entry conditions, etc.). We are not a party to, or carry any liability in connection with, any third party terms. 23. These Terms refer to Melbourne time unless otherwise stated. 24. We may need to suspend or cancel the promotion if we become unable to conduct it as reasonably anticipated due to any reason beyond our reasonable control. 25. Nothing in these Terms limits, excludes or modifies the consumer guarantees provided the Competition and Consumer Act. Except for any liability that cannot by law be excluded, we exclude all liability for any loss or damage whether direct, indirect, or consequential, arising in connection with the promotion. 26. We collect your personal information to conduct the promotion and may, for this purpose, disclose your personal information to third parties, including but not limited to advertising clients, service providers and prize suppliers.